In the early morning hours of July 19, 2010, 45-year-old ex-felon Byron Williams allegedly became an attempted cop killer. 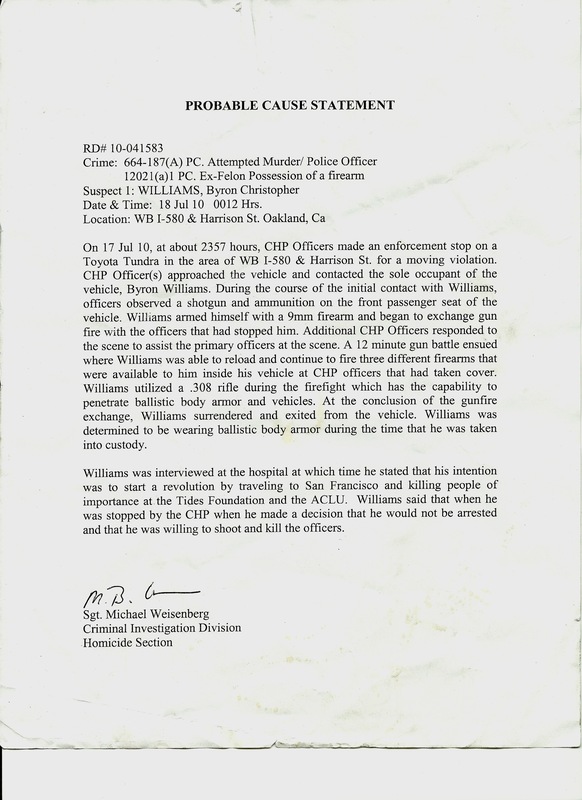 California Highway Patrol officers were able to apprehend Williams after a lengthy gun fight on an Oakland, CA freeway. Only two of the ten CHP officers on scene were injured. What does this have to do with Fox News? Byron Williams is a devoted follower of Glenn Beck. WILLIAMS: I would have never started watching Fox News if it wasn’t for the fact that Beck was on there. And it was the things that he did, it was the things he exposed that blew my mind. According to Media Matters, Glenn Beck has attacked the Tides Foundation 29 times on his Fox News show. Now, in exclusive interviews and written correspondence with journalist John Hamilton, Williams speaks for himself. 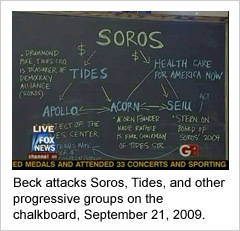 He asks Hamilton to be his “media advocate” and repeatedly instructs him to watch specific broadcasts of Beck’s show for information on the conspiracy theory that drove him over the edge: an intricate plot involving Barack Obama, philanthropist George Soros, a Brazilian oil company, and the BP disaster. In a separate exchange with Examiner.com’s Ed Walsh, Williams sought to defend Beck from “Obama and the liberals,” whom he said are afraid of Beck “because he often exposes things that are simply forbidden in news.” Williams said that Beck advocates non-violence and that he had already researched the conspiracy theories that informed his alleged plot — before seeing them “confirm[ed]” on Beck’s show. In an interview at the Santa Rita Jail, Williams confirms his affinity for Beck and references, on numerous occasions, Beck’s conspiracy theory involving the oil spill in the Gulf of Mexico and connections to President Obama and George Soros. WILLIAMS: I don’t think he’s a natural newscaster, you know what I mean? I look at it more like a schoolteacher on TV, you know? He’s got that big chalkboard and those little stickers, the decals. I like the way he does it. Williams refers to those connected to this conspiracy theory (Obama, Soros, Petrobras, etc.) as Crime, Inc. So did Beck on June 21, 2010, in one of the videos Willaims repeatedly referenced. Glenn Beck should repeat what he said on an interview on MSNBC. He said,” I could get a flying crap about politics. We are an entertainment company”. As a normal person can see through Beck as an entertainer. Entertainers don’t have to tell the truth. They can make up stories to suit their format, like a satire. Anyone who really believes in what Beck says as truth, should read up more on Beck himself. He is a billionaire, making money on his shows, his book sales. I’m not begrunging him his ability to entertain us both on screen and in book format. It is just that he should, from time to time, remind his viewers that he is just entertaining them. His remarks are so off the mark most time, anyone with a brain can see that he is an entertainer. He shouldn’t be taken seriously. The irony is just astronomical: You have Obama whose every policy he is fighting to implement (better education, tax-cuts for ~97% Americans, etc etc) is meant to benefit the same people who Fox News have successfully lied to and convinced them that he is the enemy. Just as they convinced them that they are “Fair & Balanced” when they are neither. How ironic a Beck fan commits murder. They are not too fond of cop killers in the slammer! @regina1959……….but you dont understand, 80% of americans are too ignorant and uneducated to get satire. most people i run into cant even do fractions, balance their checkbooks or file their taxes. americans are a bunch of morons driven by pure redneck emotion. give them their guns, their nooses and a rebel flag and they will follow you anywhere. It is inexcusable to advocate violence–implicit or inferred–in America, where we have so many other ways of speaking out. Besides the vote (under-used by too many), we have grassroots initiatives, petitions, peaceful demonstrations, and–the most powerful voice of all–our wallets. Make capitalism work for US by sending letters to advertisers who support people like Beck. Boycott Newscorps sponsors. Enough of Beck and his serpentine whispers from the tree branch; cop-killing (even attempted) has to be where any sane person draws the line. Fox News is disgusting. It’s not even news…it’s right wing garbage. Glenn Beck? Who let this nut out. His program is rediculous and his method of reporting it is even more so worse. I would really like this network, again I won’t call it news, taken off the air. Those calling for boycotts and shows to be taken off the air. Um……….if you’re going to advocate the cull of free speech can you at least provide some valid argument as to why we should? Which right trumps it in this specific case? You may not like what Fox says, but unless you offer a clear, unbiased reason/set of reasons for outlawing their speech, it’s a slippery slope to outlawing yours. On a more personal note, as a foreigner who knows a lot about the Zimbabwean cull of free speech, I hope you love your country enough to tread carefully on it’s freedoms.